Despite the phrase, "don't judge a book by its cover," presentation plays a huge part in how your business is perceived in the world. Custom pocket folder printing is one of the best ways to do so. A professional appearance, achieved through the use of pocket folder printing, shows potential customers and clients that you take your business seriously. What would you rather receive: a set of papers hastily stapled, or papers neatly tucked into a custom pocket folder with a company logo? We provide high-quality presentation folders printing at an affordable price. Our pocket folder printing allows you to display your company logo on sturdy cardstock with premium UV-coated finish. With custom pocket folder printing, you can keep all the important documents for customers or clients in one place. Folders are always a good organizational tool for small business owners, and custom pocket folder printing just gives your folders that extra edge. 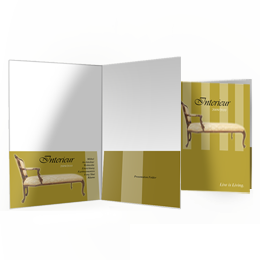 Professional presentation folders printing allows you to package your documents in an attractive, eye-catching manner. Clients and customers will have no doubt in their minds who they're dealing with when you purchase custom pocket folder printing. Presentation folders printing is one of those necessary purchases that every small business needs to make in order to show that it takes itself seriously. Order yours today!